That is such a cool photo. Thanks for hosting and have a wonderful week. That is a really fabulous picture! We have wolves at our local zoo in upstate NY and they are one of favorite animals to stand and watch! They are so majestic! Most of the time they just lay around, but this time they were playful. It was so much fun! Thanks for linking up and commenting! Have a great week! Thanks! And any exercise is good exercise. Have a great week! Theres really nothing better than seeing animals at the Zoos! It is a great time! Thanks for linking up and commenting! Have a great week! I'm so excited!!! A new blog to read !!! Welcome! I'm so glad you stopped by! you were so lucky to get such great sightings! 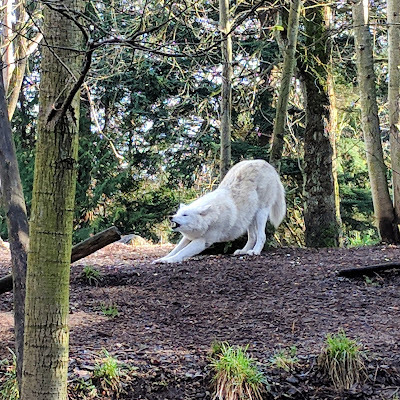 I don't think I've ever seen a wolf and didn't know they had them in zoos. It's quite beautiful isn't it and the pose reminds me of the cat's morning stretch. Very nice shot. Thanks! It is part of the local "Northwest Trek" part of our zoo. Have a great day! That's amazing that you caught that photo! I love that the wolf is stretching. I was so excited when I saw that I got the shot. It was fun to see them actually moving around. Have a great week! I love how your zoo imitates nature so closely! I would have never guessed that this photo was taken at a zoo! It never ceases to amaze me how big wolves are. They do a great job with it and they really do a lot with and for the animals. We are very lucky to have it so close. Sorry I haven't been around. I've got the Flu really bad. Total bummer! My son would love this pic. he loves wolves! Thanks for stopping by.